Before I get into the contents, how cute is the tin? 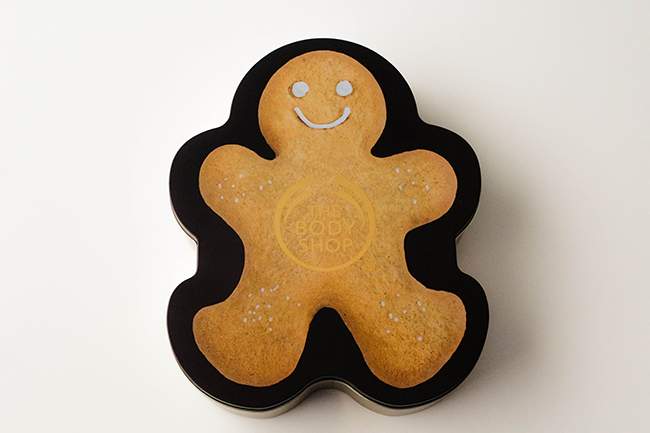 Shaped like a gingerbread man which then gives more of a Christmas appeal than a Gingerbread house box that the contents could of been placed into. What's inside this reusable tin? Four products that are ginger infused, a smell I have around me a lot due to my Grandma's love of it for just medical purposes but besides ginger beer, I'm not too keen on the smell at times it's too overbearing for me. Although in this tin, you get a spicy ginger scent from these four products, ideal for the upcoming Christmas season, it smells just that. That's one thing I adore about this time of year, comforting scents. So of course why not start and end the day with that. You get a Ginger Sparkle Body Polish 75ml, Ginger Sparkle Body Butter 50ml, Ginger Sparkle Mini Heart Soap 25g & a Ginger Sparkle Shower Gel 250ml - I love how small & cute the heart shaped soap is. As always The Body Shop's body butter is my favourite, always moisturising, the shea butter used within this tin is Community Fair Trade from Ghana. This was sent to me for consideration to review / feature. This is so keeewwt! Love it and now I want a gingerbread man.